The Excel Business Plan template for investors is designed to relay financial forecast information in a compelling report format for potential investors and presentations. The input is set out to quickly create professional reports that summarize the business plan financials as well as risk factors considered for the ongoing business. The business [plan solution is ideal for startups and existing businesses seeking funding for new investment opportunities. Input and calculations integrate full business plan financial information into the investor presentation. Workflow and layout facilitates a stepwise process for entering and reviews the key factors that make up the overall financial plan. Sensitivity analysis can be conducted in real time to investors to convey best and worst case scenarios for the business as a going concern. Summary reporting shows the overall return to investors with financial summary as well as the critical risk factors to consider when committing capital to the opportunity. 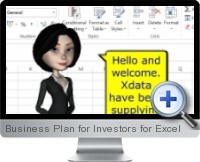 The business plan template supports all versions of Excel and is provided with detailed help and guidelines for use.